Well, what a night that was! Amazing results, although slightly disappointed that the UK didn’t do better. I cannot believe that we are going to Austria next year, who would have thought it this time last year? Austria have a bad record when it comes to Eurovision but they proved everyone wrong and came up trumps last night. Conchita Wurst is an absolute legend. She proved all of the haters wrong and showed that love always prevails. Whether you liked the song or not, the fact that she won proved that Europe are a whole are accepting and liberal and there is no room for prejudice. It was also great seeing The Netherlands come second. Yet again, they have a terrible history in Eurovision results. Only two years ago they failed to qualify for the final for the 8th time in a row. Last year they came 9th but have now gone even better with a fantastic second place. There were some odd results last night as well, I mean why was France last with only two points? The song was really uplifting and full of energy and it was most definitely a crowd pleaser. I don’t know what it will take for France to get a good result, maybe they might withdraw next year? Talking of next year, I am so excited that the contest may be held in Vienna for the 60th anniversary. It will be an amazing show and I can’t wait to go out there. Hopefully the fact that a Central European country has won this may persuade Czech Republic and Slovakia (who neighbour Austria) to come back. I imagine we might finally see the debut of Liechtenstein also. 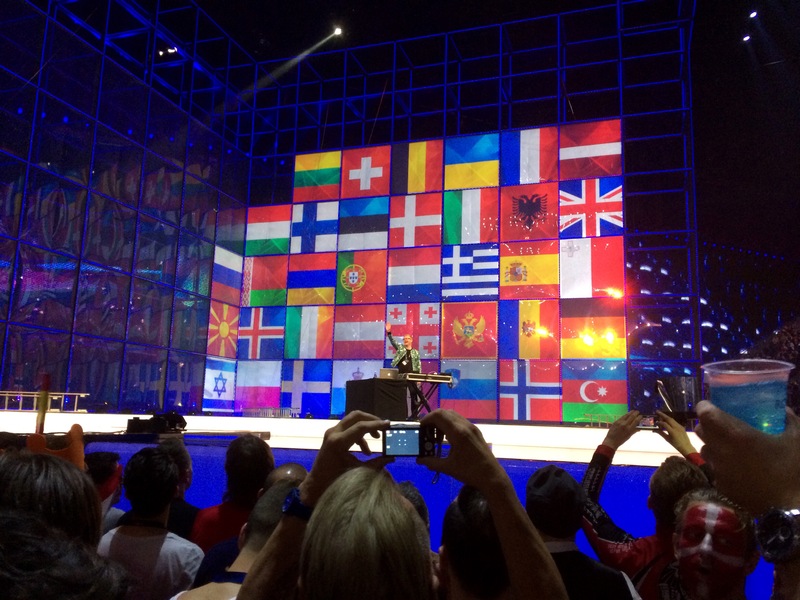 Anyway, this is the end of me blogging about Eurovision for about a year. It was great seeing so many of my “Eurovision buddies” and was nice to meet new friends too. I particularly made friends with a group of Dutch guys who were very enthusiastic throughout the final and lended me some fancy things to wave at the cameras. I hope you have enjoyed my write-ups. Please feel free to comment and share your views. Did the right song win? Did anything disappoint you? Will you be in Vienna next year? Get in touch. I am just about to land at Heathrow so it is well and truly back to reality! P.S. Check out my compilation video! Was it Austria’s first win? I can’t remember another one. Second win to date, they last won back in 1966. Been a long time coming! That’s probably why I can’t remember, ha!